It's hard to know where to begin but here's a quick overview. The "Rainbow" is the standard Snazaroo palette. Each eight color palette will easily paint fifty full faces. Each kit comes with eight colors, one professional sponge for application and a detail brush. Included in this boxed set you will have a full color 20 page guide. In this guide you will find several step by step instructions along with many face painting ideas. 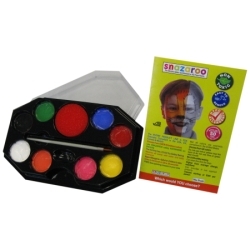 The guide also provides you with internet links and resources for the face painter. Available as a rainbow palette or UV black light palette. Rainbow colors: White, Black, Bright Red, Orange, Bright Yellow, Grass Green, Sky Blue, and Bright Pink. UV colors: Light Green, Green, Light Orange, Orange, Pink, Light Red, Red, and Yellow. Please note that the UV colors are designed to be used under a black light and will not show up as well under normal lighting conditions.